They think they’re just innocent little nanner muffins studded with bluebs but they ain’t foolin’ NOBODY. We see right through yewwwwwwww. 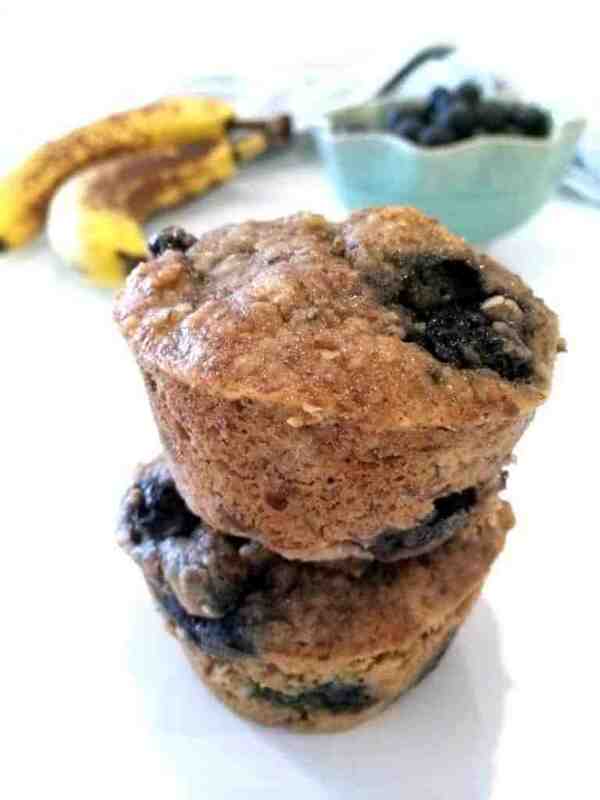 Do normal nanner muffins pack a whopping seven grams of protein and five grams of fiber? Errrmmmmm no. No normal nanner muffins have hemp seeds and flax seeds and oats, oh my? Oh and do they legit taste like the best nanner muffins you’ve ever laid mouth on? I think not. True story. The other day my dad asked me if hemp was the same thing as marijuana. WAIT–what? I loled. Frankly, it was less of a question and more him looking for confirmation. Yes father, I made weed muffins for you. After a quick google search, I discovered that hemp and Mary J come from the same plant, cannavis sativa. The difference lies in its use. Apparently industrial hemp grows differently (and in different areas) than the THC-producing plants intended for recreational use. So sorry, these muffins won’t make you high…but they will make you healthy! Have I talked too much about hemp and too little about my neurotic frozen blueberry stash? I think so. Another true story. The other day I bought a humongous bag of frozen blueberries at Target on sale for $10 because I’m sick of having to go to Whole Foods twice a week for the itty bitty bags. Considering I have the same chocolate blueberry smoothie for breakfast like every day and thus eat a cup of blueberries every morning without fail, it’s simply not economically logical to buy the little bags. So now I have enough blueberries to open a blueberry store. Enter the banana muffins that became blueberry banana muffins. Everything leaves my kitchen blueberry flavored. I cannot wait to have a Costco membership and buy huge bags of alllllll the things. And maybe a water tower full of almond milk. While we’re on the topic of weird ingredients, let’s discuss spelt. Spelt isn’t all that weird at all. It’s essentially a totally under-rated whole grain that’s been around for thousands of years. In addition to tasting more mild, nutty and sweet than wheat, it actually requires less pesticides as well. While spelt creates a bit of a lighter final product, spelt and whole wheat are fairly similar nutritionally. Spelt does have a lower glycemic index than wheat however, meaning it doesn’t cause a spike in your blood sugar as quickly. I buy spelt flour in the bulk bins at Whole Foods. I like to switch up my grains, so spelt it is! Adding almond meal also makes a super moist product that’s lower in carbohydrates and higher in protein. Cue the ooohs and ahhhs of my carb-hating hashtag paleo friends! Even though hemp is in the name of these muffins, you can easily make these muffins without the hemp seeds if you don’t have any on hand. They’ll be lower in protein and you won’t be high on life, but the flavor and texture will say the same. Cheers to eating all the blueberries. 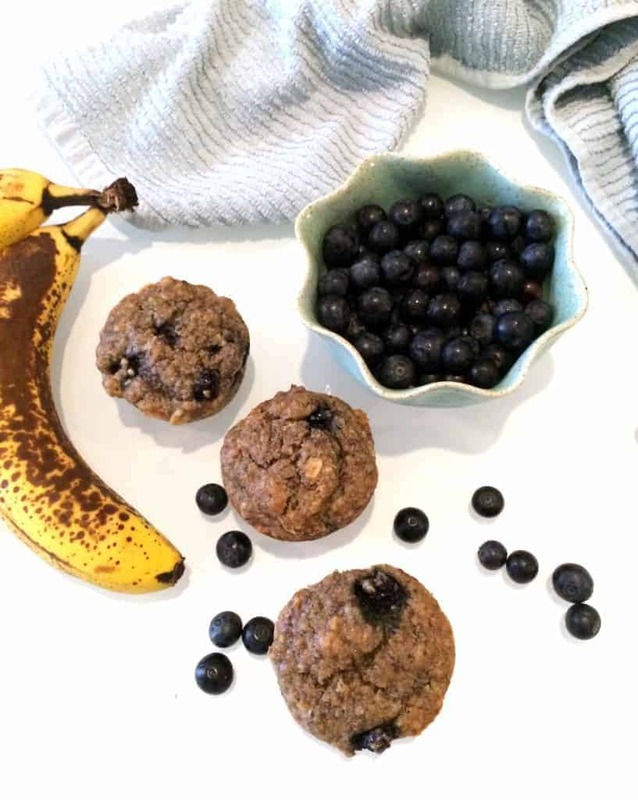 Packed with flax, oats and hemp seeds, these lightly sweetened, super moist whole-grain blueberry banana muffins are the perfect healthy snack. Pour batter evenly into muffin tin (I got 11 muffins). These look great! I could do with a bumper pack of frozen blueberries for smoothies too! That and bananas and spinach!! Healthy muffins that are tasty – hello! I’m so with ya on the nanners and spinach! Total staples. Hahaha! I LOLd while reading this. You’re hilarious, if you didn’t already know! Hemp is one of my favourite ingredients and so are blueberries. It’s just not a day without those two. Oh yeahhh Costco memberships are the best thing ever -that’s where I get my manitoba harvest hemp heart bags. Deal city! Also, I could really picture that water tower full of almond milk, which would go perfectly with these muffins Mmmmm. I never buy frozen blueberries because I find they’re so messy and they always stain my kitchen/my clothes/my skin blue and purple haha. I can’t wait to get cheap fresh blueberries at the farmers market when they’re in season in a few weeks! My lips are always bright blue after breakfast so I know how you feel! So, you are gonna feel like chucking one of these muffins at me as I used to think that if I was pulled over and for some weird reason given a blood test, hemp would give the same reading as marijuana! Yup – I had some crazy reasoning skills in my late teens! Costco memberships are the BEST – but, I haven’t seen Almond milk at the Costco I frequent, as for blueberries – they have containers bigger than the ones at Target – your eyes will pop! 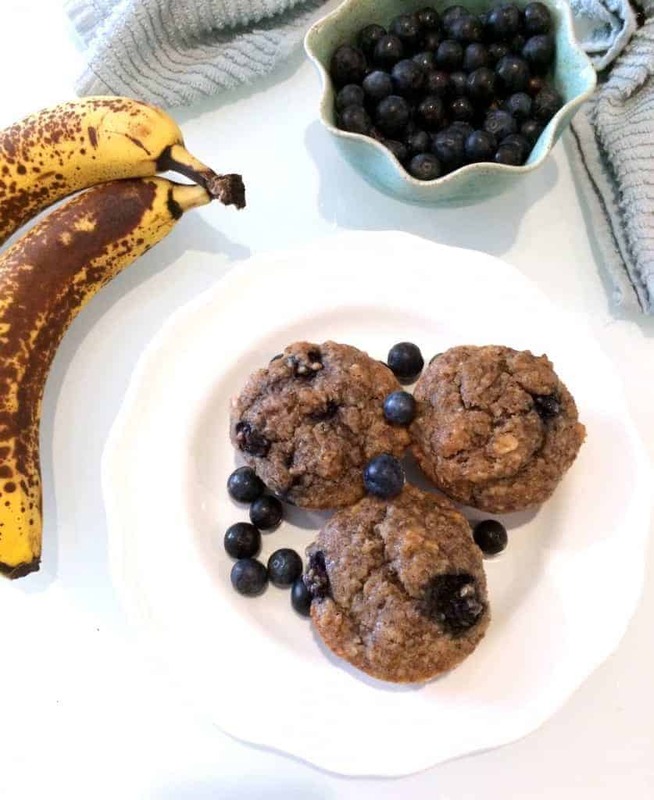 These muffins are so packed with goodness – and with nanners and blueberries and oats and cinnamon – they have some of my fav ingredients! So yum!!! Hahaha that’s so funny! Like poppy seeds and opium! No almond milk at Costo?! Oh no! Mmmm…I love muffins, but they’re typically so unhealthy so I love this healthy version. They sound delish! It’s crazy because I would never buy a muffin at a coffee shop…more like a cupcake without the frosting, right?! I bought my first… bushel? pint? quart?… erm… pack ( :D ) of blueberries this weekend — it’s like I was getting ready for this ;) Love everything about these. Except the fact that there isn’t one currently sitting in front of me! You neeeeed to use your pack of bluebs in these! They’re freaking amazing my friend. I know how much you love a good muffin girly! OMG I need to buy a bag from Costco! I’m already done with my first bag and it’s been like to weeks. Giiirl, you sure know how to brighten up my sleepy Monday morning (I don’t wanna go to work! Oh look, muffins!). This post cracks me up. I did NOT know that about hemp seeds! I mean, I literally just learned that hemp seeds existed last week. I feel like such a hippie, I love it. I’m so freakin’ badass with my hemp seeds, yeahhhhh. Also, I’m convinced you’re Superwoman b/c IDK how you have time to do 1,000 things. Let me – study for the RD exam, cook & feed myself, sleep, workout, create amazing recipes, take beautiful pics of them, and write hilarious & informative blog posts like it ain’t no thang. Have hemp seeds given you magical powers?! You are efficient, though, that’s for suuuure! Seriously though, these photos are amazing. You can literally SEE how moist and incredible these muffins are. Let me also admit that I’ve already made these and THEY ARE THE BOMB! Like, I’m obsessed. I’m already planning on making another batch for brunch with friends this weekend, along with your skinny summer berry crisp. C’mon nanners, ripen for mama! I LOVE FOOD. AND YOU. AND BLUEBERRIES. AND MUFFINS. LET’S EAT ALL THE THINGS. Now not only do you know that hemp seeds exist, but you know that they’re fantabulous in smoothies AND that they have a sister named Mary-J. You learn something new every day weeee!!! Love ya. These look amazing! That bag of hemp seeds in my pantry is calling me to bake them in something. Happy Summer to you, and thanks for the great recipe. Now I have something for the ole “cannibus” besides brownies(I prefer the hemp with the Tetrahydrocannabinol(THC))(grin/shrug). Now I will be happy, & healthy..?? LOL. Ever thought about going into the edibles business? Well I have and could use a good business partner! Ya once or twice…or a million times. For realz, we could have something here! Great post! You’re the first blogger I’ve seen address the hemp vs. mary jane issue..so cheers to you for “breaking the silence”. I wonder how many people you just educated with this post? I just so happen to be one of those people who sees absolutely nothing wrong with baking with actual cannabis too..brownies, cookies, butter, ad other edibles too. Why the heck not?! I believe it’s all so good for the soul. Yum! I ended up with 24 mini muffins and 6 regular size. My 2-year-old loved them…pretty sure he ate 5 mini muffins this morning!! I used homemade date syrup instead of maple syrup. Random question I’ve been meaning to ask a recipe creator…Does the salt affect the baking/rise of the muffins, or is it just for taste? I never add salt to anything (except bread since I know that bread needs the salt to help it rise), but I wasn’t sure if it makes a difference for muffins. Thanks for all the great recipes, and congrats on becoming an RD! I’m so glad you liked them! Great call on subbing the maple syrup for date syrup. Salt does affect the taste and texture. It strengthens the gluten in the flour (spelt in this case). I’m not sure how it works with gluten-free goods, but I do know it’s important for flavor too :) You’re so welcome, Ashley! I just made these and wow- they are so tasty! I didn’t change a thing, thanks for sharing. This recipe is great! I found my batter to be very dry. I ended up adding 1 1/4 cup of almond milk. Did I miss something? I used coconut flour instead of spelt flour and 2 flax eggs instead of eggs. I’m honestly not sure. I know that tossing frozen bluebs in some flour helps prevent them from sinking! Either one would be fine I think. Omgggggg. I love these. I just made them this morning (the only two changes I made were using tj’s gf flour instead of the spelt and doubling up the flaxseed because I didn’t have hemp seeds on hand) and it made 12 beautifully delish muffins. I’m so thankful for this healthful recipe that tastes so good. I have already eaten 3. So good! Yay! I’m so glad to hear that all of your changes worked!! Great write-up! You’re the first blogger I’ve observed target your hemp as opposed to. jane helen issue.. thus many thanks to your account with regard to “breaking your silence”. My spouse and i question the number of folks you simply educated on this write-up? I merely thus happen to be one of those people who recognizes practically nothing incorrect together with preparing together with true hashish as well.. brownies, snacks, butter, advertising additional food as well. The reason your bejesus not?! I believe it’s many so great to the soul. I am not a good enough baker to know what to add for moisture. But I’ll try again these just look too amazing !! Hi Chelsy! Unfortunately coconut flour is super tricky. It’s really absorbant and requires a bunch of extra liquid and eggs. If you’re out of spelt flour, good substitutes would be whole wheat flour, all purpose flour, or gluten-free flour. I am allergic to almonds (and all nuts :( :( )…anything that you would recommend instead of the almond meal? Hmmm I’m honestly not sure! You could try oats and maybe add a couple tablespoons of oil to the batter to help make up for the fat? Great recipe! I used all hemp flour instead of spelt and it is really lovely. Will try with the spelt flour next time. Mmmm hemp flour sounds amazing! I’v never used that before. I changed the recipe a bit since I did not have flax so instead I added pumpkin seeds, chia seeds (along with the hemp seeds) and also used frozen mixed berries. They turned out GREAT! Thanks for the recipe! I love your recipes and web site. I am striving to eat healthier so I am now more aware of calories too. 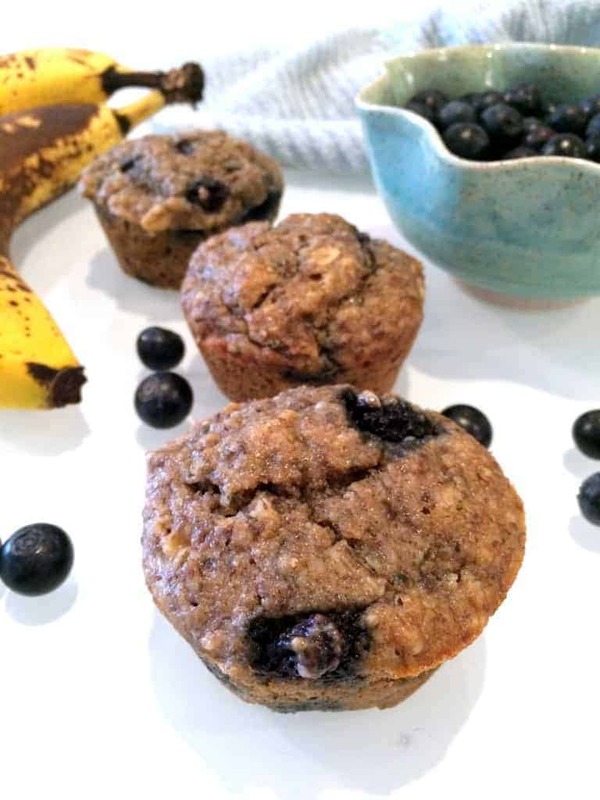 I would like to know the amount of calories in the banana blueberry hemp muffins, if possible. Thank you so much. Hey Lena, I don’t believe in calorie counting so I don’t post nutrition information. Thank you! Thanks for sharing this post. I am very interested in this topic. I would like to share my opinion on cannabis shirt By this tube, the fats is vacuumed away. One other methodology is by surgically eradicating redundant pores and skin and tissue then suturing the area closed. Very effective Post for Best recipe ..Thanks For Sharing. made up of molecules that are in a continuous state of motion, or vibration. The quicker the vibration, the far more fluid a substance is. you want into your lifestyle. Shame, guilt, blame, anger, and detest are examples of small vibrations. You can understand when you are in a minimal vibration since you experience bad. vibrations. You can understand when you are in a substantial vibration because you sense great! I have a friend who has been a mentor to me for decades. She is an individual who has succeeded in each location of her everyday living. time. I needed to study her key so I frequented her and questioned her a good deal of inquiries. comprehending and application of gratitude. to take a look at my new comprehension of gratitude. the authentic estate bubble started out bursting. of attraction and bring the customer promptly. No consumer was coming. and it was stressing me out (worry and irritation are reduced vibrations). In the meantime, we experienced moved again to Dallas, Texas. We were in our new household and I knew my husband’s business would spend our Arizona mortgage loan for six months. As the six thirty day period period was coming to a near I tried using as hard as I could to experience as a great deal gratitude as feasible. offer just before we would have to make double dwelling payments. I was so exceptionally grateful that for a sound 7 days I did almost everything with comprehensive gratitude. I did not encounter any tension or disappointment — just complete gratitude. told us we experienced an give on our house. We shut much less than a month afterwards. From that experience I discovered the change amongst currently being grateful and residing my daily life in finish gratitude. of the matter I was dissatisfied and inclined to complain when I was not getting the final results I needed. how I generally wanted to reside my existence. Devoid of locating a spot of comprehensive gratitude, would our Arizona household have offered? Of training course… ultimately and with a whole lot of anxiety! Do I still get pressured, discouraged, important, or dissatisfied? begin journaling gratitude right absent. It truly aids me to generate the points I am profoundly grateful for. zone — obtain what works for you and do it as normally as you have to have to. When you get accustomed to the “gratitude zone,” you would not at any time want to depart it.